We newly realized that the SharePoint Search has a strage effect when you sort the results by title. We have a custom java application, which uses the SharePoint search web service to query and display search result from a non SharePoint Site. The first 50 results are ordered, than the next 50 and so on. After digging a while and contacting the MS support we found out that this is a SharePoint bug with multiple indexes. If you have multiple indexes in your search application you'll get this result. If you select a user list field to be displayed in Nintex E-Mails you usually get the user login, like "domain/cmasters". If you want to display the full name of a user, you can use the "Search User Profile" Action in the "Integration" tab. When you configure the action, you can select the user list field from the item to be saved in a text variable. 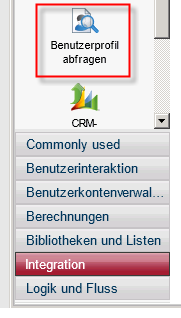 You can also select which profile property to read and to be saved in the variable. Now you can use the variable in all other actions. Betty Winner (FR/I) but it displays still the old one. More worse in some sitecollections the name is displayed correctly whereas in others not. Why is this happening ? This happens because SharePoint stores all user, which were ever logged in a site collection in a special database table "UserInfo Table". This information is stored for every site collection. A question which is often asked is how you can synchronize a SharePoint list with Excel. The answer differs on what version of Excel you use. Excel 2003 with SharePoint 2007/2010 With Excel 2003 the synchronization works in both directions. This means that you can create a SharePoint list connect to Excel, make changes in Excel and write back to Excel. The single restriction is that you can't create new items in Excel but modify existing ones. To synch the lists go to the list you want to synch and click on "Export to Excel" button in the ribbon.